In a s report tagged “Police is not our friend”, a Facebook user, Akinmade Boluwaji has shared his encounter with policemen at Ifako Police station. According to him, his church member found a wandering child and took him to a police station after which she was detained. 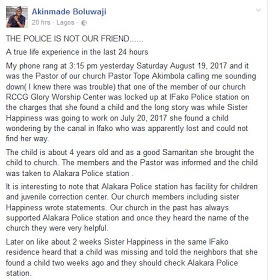 My phone rang at 3:15 pm yesterday Saturday August 19, 2017 and it was the Pastor of our church Pastor Tope Akimbola calling me sounding down( I knew there was trouble) that one of the member of our church RCCG Glory Worship Center was locked up at IFako Police station on the charges that she found a child and the long story was while Sister Happiness was going to work on July 20, 2017 she found a child wandering by the canal in Ifako who was apparently lost and could not find her way. The child is about 4 years old and as a good Samaritan she brought the child to church. The members and the Pastor was informed and the child was taken to Alakara Police station . It is interesting to note that Alakara Police station has facility for children and juvenile correction center. Our church members including sister Happiness wrote statements. Our church in the past has always supported Alakara Police station and once they heard the name of the church they were very helpful. Later on like about 2 weeks Sister Happiness in the same IFako residence heard that a child was missing and told the neighbors that she found a child two weeks ago and they should check Alakara Police station. Long story cut short the police arrested Sister Happiness yesterday that she must know about the missing child and that she was involved and why did she not come to IFako police station in the first place. She was immediately locked up at the cell of IFako Police station since yesterday morning. Now why will citizens want to help their neighbors or the Police. This morning our Pastor grabbed me at 7:45am in company of his Assistant Pastor Bayo Ajayi and we started working up our phones. Eventually I got to speak with the DPO of IFako Police station. That was the drama of my life. He said why did she go to Alakara Police station and not IFako Police station? I explained to him that not everyone has education to know that the nearest police station was were to report a matter and that he will be shocked that people are scared of police and pure ignorance. He even went micro by telling me that Sister Happiness should have shouted that…..the people around can intervene. I was disturbed that SP Smith a senior officer in the police force can think like this. I appealed for at least 45 minutes on the phone and I even offered to see him immediately he said he is not at work and she will be charged to court on Monday and that was his final position. At this point I started racking my brain on who can help intervene in this simple matter? I tried getting the phone no of Mr Fatai Owoseni the Lagos State Commissioner of Police but no luck. I finally got an old friend who I had to wake up Assistant Commissioner Of Police , Kola Okunlola .Thanks to technology I had to do a three way call. I finally connected my ACP friend with DPO IFako. Now my worry must we know someone to get things going in Nigeria??????? 4. What did he do to the parents that were careless by not taking care of their child? He said he arrested and released them immediately. 5. On the board at the police station where you state the person in the cell and the offence what did you state as the offence of Sister Happiness? He said Misconduct. At this point I just gave up and said under my breath that police is not just our friend. The ACP adviced him to release Sister Happiness and get a reliable surety that will produce her anytime that she is required for investigation. That charging her was a waste of government resources. Now the DPO IFako has requested that we all report at 8am tomorrow. My question and worry ……what is Misconduct for a good Samaritan that saved the life of a vulnerable child? The child was not kidnapped or kept away. 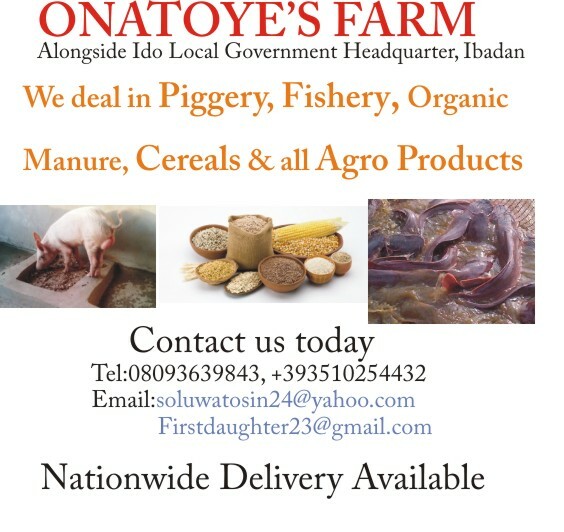 I am appealing to anyone that has contact with the Lagos Police Commissioner to help circulate this …. I hope we will not discourage other good Samaritan s being their brothers keeper.